Browse: Home / iBeacon in Hotels? iBeacon is coming to a hotel near you! The James Hotels, with locations in New York, Chicago, and Miami, has just released a new app, the James Pocket Assistant. And you guessed it – it features iBeacon integration! The app promises to give hotel guests a concierge like experience, providing location-based suggestions for dinner, shopping, and activities. The app also offers basic features like the ability to check-in, check-out, extend one’s stay, a map, order room service, book a spa appointment, and of course one-button communication with the front desk. With all of these features, it’s easy to envision a future in which hotels are a completely frictionless experiences – no unnecessary interaction with hotel staff required. As far as iBeacon integration is concerned, the app can give guests a “self-guided art tour” through the hotel’s art collection. iBeacon will also be used to send users offers and perks based on their location. It’s easy to imagine other iBeacon applications in the hotel environment. How about keyless entry to your room, where an iBeacon picks up your phone in close proximity and unlocks your room door? How about the thermostat and lighting adjusting to your preferences upon entry? iBeacon could even be used to offer dynamic maps of hotel amenities depending on location. Although this is but an early adventure into the possibilities of an iBeacon-enabled hospitality experience, it certainly is exciting to see big players in the industry leaning towards adoption. The applications are endless. 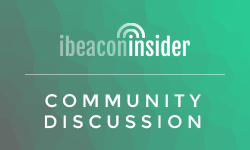 If any of our readers have any other ideas on hospitality-related iBeacon applications, please let us know in the comments! We see a lot of potential for ibeacon in hotels&resorts. Our Guest relationship Management and concierge platform now includes iBeacon capabilities. Push can automatically be sent to guests depending on the time and the location. The front desk team can also be informed if a guest arrives in the lobby for instance.